Beach volleyball national champions celebrating in the Alabama surf. Photo by Rob Koehler. When your inbox stack of facts and figures range from A to Z (Alabama, site of that Sand Volleyball championship to Zator, as in Hillary the, 10,000 meter star for the track team) it must be time for another session of the wildly (or mildly) popular Notes on My Napkin. The first note is about the new kids on the dig, spike and block: sand volleyball. Still not enough teams for official NCAA sanction the food, beverage and sunscreen industries threw the party for the second year in Gulf Shores, Alabama, and frankly the crowds and cash infusion was enough that insiders say that the tourney will be Alabama-bound through 2015 and longer if more teams take up the big action in the small uniforms…Florida International coach Rita Buck-Crockett said that scenario is “right around the corner.” This year the AVCA picked six teams (out of the 30 schools that played in 2013) to compete for the crown at a public beach where Highway 59 meets the Gulf. The pairs-championship added 10 more at-large duos and while LBSU won the team prize, a lot of folks got a taste of the pair’s party. On the baseball note card is that popular barometer of success, no, not won-loss records but attendance. The top five crowds all belong to the SEC: 1. LSU average of 10,811; 2. Arkansas, 8,251; 3. Ole Miss, 7,840; 4. South Carolina, 7,385; and number 5. Mississippi State, 7,346. Okay so you crave LBSU facts and figures. Fresh from two close games at Fullerton LBSU road tripped on Tuesday and beat Pepperdine 5-3 behind a balanced effort from sluggers Jeff McNeil (three hits) and Juan Avila two hits and two RBIs. That win upped the Beach record to 22-24 and show cased Jon Maciel who was dominant in relief. Coming in for the Dirtbags in the bottom of the seventh inning, Maciel allowed a leadoff single, but then retired nine straight Pepperdine batters to collect his sixth save of the season in support of Ty Provencher, who improved to 2-0 with 2.1 innings of work in relief. The Dirtbags now get their first Blair Field visit from Hawai’i for three games beginning on Friday, May 6, and will then play the Waves once more next Tuesday at 6PM. And we do owe you that note for the letter “Z” so we are pleased to report that the fastest 49er in the 10,000 meters at the Cal-Nevada championship last month was our competitor Hillary Zator who was just four seconds short of the gold medal with her time of 36:17.77. The sports gossip-eers are still grinding on what new transfers are coming in and what old transfers are going out. Film at the end of finals. On the ladies side there is a Sunday fund raising and friend raising visit from the professionals of The Los Angeles Sparks of the WNBA. Profits from the 1PM preseason exhibition game at the Walter Pyramid on Sunday (between the Sparks and the Seattle Storm) is thanks to Beach legend and Sparks GM Penny Toler. Toler, the Sparks’ Executive VP/General Manager, was a star for the 49ers in the late 1980’s, leading the team to two NCAA Final Four appearances (1987 and 1988). She still holds several school records and was honored as a Kodak All-American and conference player of the year. The first important competition of the weekend is really the Saturday breakfast tennis match between #45 LBSU and #32 Oklahoma State in the opening round of the NCAA Tournament at UCLA. The host Bruins play Army in the second match and the winners advance to Sunday. The match will mark the first time the 49ers (21-3) will play the Cowboys (15-8), who hail from the Big 12 Conference. 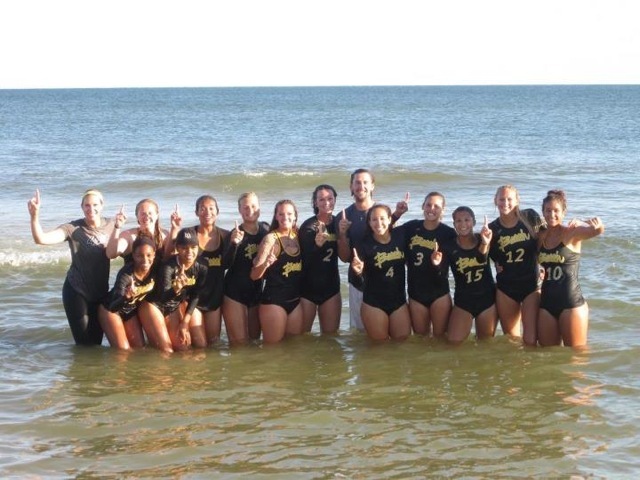 LBSU has advanced on to the NCAA Tournament nine of the last ten years and this year marks the third time in a row after the 49ers black and blued UC Irvine on Sunday in the Big West Tournament Championship match. In last year’s NCAA Tournament, third-seeded LBSU blanked No. 2 seed, Arkansas, 4-0 before falling in the second round to eventual national runner-up, UCLA. The Bruins will play Army in the other 2013 regional match. More notes from baseball in the house last week was former Oakland star and former LB star and genuine good guy Bobby Crosby. He got close to making the Brewers over the winter but now is working for his agent in dealing with prospective college kids who have MLB potential. Brennan Metzger is still on the medical list and has had some surgery recently. Send him your good wishes and mine too! C club golf had an appearance by the old 49er football announcer Jerry Scanlan who is a gazzilionaire real estate guy. And Rob Brender the talented voice of Niner hoops has left the law enforcement biz in the inland empire and shows up almost anywhere where a microphone is unattended. The vice presidents of LBSU will host a blue-ribbon-quiche-and-cheese-and-wine bye bye party for Beach president F King Alexander in the Pointe on May 20. His next big party will probably have a more Cajun menu in Baton Rouge where he takes over SEC heavyweight LSU. Women’s basketball will also be changing menus this summer too when they take an August basketball tour to Great Britain. Team bonding and a warm welcome from team mate Ella Clark plus lots of ABC’s (tourist slang for “another bloody castle”). The schedule of games is still in flux but NCAA allows these deals every so many years. Women’s softball still has flickering hopes of sneaking in the post season but that Saturday home double header (senior day) with formerly great Fresno State is vital.